Born and raised in Walkerville, Bonnie now lives in St. Andrews By-The-Sea in New Brunswick. Five Thirty Three Windermere is no more, nothing remains. I had returned after 35 years, only to find myself standing in a parking lot, feeling overwhelmingly sad. Never mind. I soon found something very special ­ my initials and long lost friends' initials in the cement sidewalk. My fingers ran across them fondly. Yes! This is where I spent my childhood! 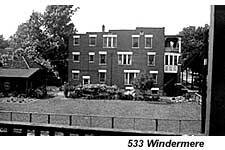 Grand Barnes' big, three story, red brick apartment building and the barn-like garage, the beautiful garden, all gone. But not really ­ I can still see it all, and grandma still standing at the driveway gate. 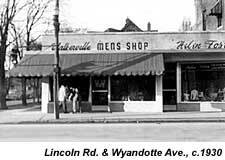 Mom, Dad and I lived at 580 Lincoln, in the big home that they had moved to the back of the lot to build two stores on Wyandotte. Grandma, being so close, gave me a pleasant refuge from that hectic corner of Lincoln and Wyandotte. Grandma had so many wonderful tenants over the years. All with their own stories ­ Thelma Montrose, Millie Morrow, Miss Harkness and Elmer Sirs ­ I remember them well. As I stood in that void, so many great times started to well up from my memory. The roses, oh, the roses. The whole perimeter of the yard was filled with every colour imaginable. And the fragrance was so memorable that to this day, some rose perfumes put me right back into Grandma's garden. The garage had the most magnificent cascade of red roses, which almost hid an old weathered window and door. It was a picture to behold every spring and summer. But the best was Grandma's big old apricot tree. A plethora of fragrant pink blossoms, her pride and joy. That stately tree supported my swing, and itshaded half the yard. The fruit ­ well, how can I tell you ­ just heavenly. I remember the Mother's Days and the Children's Days we celebrated at Lincoln Road United Church with Rev. Sam Henderson and his wife, who always wore the most beautiful spring hats. Those days meant bouquets of lily of the valley, roses and lilacs. That garden celebrated those memorable times as much as we did. Tulips, daffodils, and narcissus lined the driveway and offered up their blooms for our spring bouquets. Lily of the valley blanketed the ground beneath the apricot tree, and along side the garage. Hands full of this fragrant delicate flower always went to now forgotten teachers at King Edward School. But my favourite was the trellis covered with sweet peas. Every year, they would reappear in great profusion and to this day, I grow sweet peas just because they were a part of my childhood. Now I have what I call my own "Grandma's Garden". I have moved to St. Andrews-By-The-Sea in New Brunswick. There, my son Jeff and daughter Christie, help me operate a beautiful bed and breakfast called, "It's The Cat's Meow B&B". My garden is so much like Grandma Barnes' garden that I feel like she is gardening right along side me. The lilies, roses, lilacs, fruit trees, and on and on, have all come full circle in my life. Everything reappears every spring, much to my amazement. Every blossom is a loving tribute to "Grandma's Garden".